For us who love shopping but don’t want to spend much money on the not-so-basic necessities in our house we always look for big sale, best deals and discounts. Having discounts saves us money and it feels good to get a good bargain especially when you really want the item for your family. It’s better if you will find coupon codes to use as discounts for the things you want to buy online. 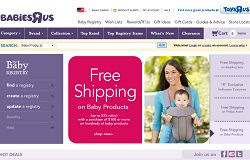 I was looking at Babies R Us for baby things and accessories on sale and I found some babies r us coupon codes, discounts, offers and special deals for free. I’ll have to buy something for the babies here in our compound and I’m glad to find some good deals. Just have to take advantage of those free coupons to make the most of my money.